The most obvious reason to remove a tree is that it is dead. Or it might be sick and the decision is that it can’t be saved or isn’t worth saving. Then there are volunteers. Volunteers are probably not what you are thinking. They are plants or trees that self plant because their seeds have flown there or birds have dropped them there. If someone isn’t paying attention they can become quite large and then it is a chore to remove them. Or in some cases, the tree is planted on purpose but is never trimmed and it becomes much larger over time and no longer makes sense for the space or location. The last main reason to remove a tree is that you are doing some landscaping and the tree no longer makes sense in the grand plan for your property. Smaller trees aren’t that difficult to cut down if you are careful and have ever done something like that before. Larger trees can be dangerous and should be done by a professional. There is the problem of a branch or the tree falling on you or kicking back on you. Then there is the problem of the tree falling on other plants or trees or onto a house or other building. If there is a large property with lots of space, it is possible to play Paul Bunyan and just drop the whole tree, but that is the exception. Normally we need to climb the tree and lower branches to the ground until we have taken the tree most of the way down in pieces and then we cut the last part and drop it. It is dangerous enough just climbing into the upper branches of a large tree. We have trained climbers who do this on a regular basis and are experienced. They put ropes up that they are tied to in case they fall. Then, with separate ropes, they tie off the branch so that when it is cut, it can be lowered under control to the ground. We have people on the ground controlling the lowering of the branch. There might be two ropes, one to support the weight and the other, tied further out, that can be used to pull the branch and maneuver it around other branches or objects. Remember that the climbers are balancing on branches and using a chain saw. If the tree is dead, there is also the issue that the branch a climber is standing on may be rotten and may give way and break while he is cutting another branch with the chain saw. When the branch is cut it can kick and possibly knock the climber out of the tree. This is actually the lesser of the possible problems because the climber is tied and won’t fall to the ground. But if it kicks the wrong way, it can pin the climber against the trunk or another branch. We take great pride in our safety record and that is why we also regularly do training. Sometimes, rather than climbing and roping, cranes or lifts are used for tree removals. This is frequently done around power lines or if a tree is very close to a house. Remember, if you try and take a tree or large branch down yourself and it damages your house, an office building or other structure, you could have larger expenses than if you had just hired a professional tree removal company in the first place. Also, don’t forget that we are bonded and insured. We don’t expect anything to go wrong, but in the off chance that it does, our insurance will cover it and you won’t have the likelihood of your insurance rates going up. ​Call us 24/7 at 410-793-1013 for emergency storm damage tree removal. 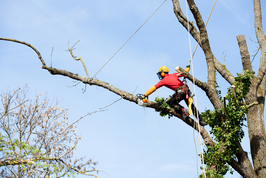 Our tree surgeons are especially trained for emergency tree removal. Once the tree is down, we have stump grinding capabilities to remove unsightly stumps. This helps prevent the tree from sprouting again and also makes it easier if other trees or bushes are being planted in the area. Tree Services Annapolis not only does the tree removal and the stump grinding but we also plant trees. In addition, we can split the logs for firewood. Of course, that would only be hardwoods like oak and maple. Softwoods such as pine have too much sap / resin and can cause buildups in your chimney leading to chimney fires. For your safety and peace of mind, call Tree Services Annapolis and let our professionals handle your tree removal needs, whether it is for your home or your business. Fill out the form to arrange for a free estimate or give us a call at 410-793-1013.